Thanks to local business man, Andrew Reynolds the Dial-A-Ride service now has a new vehicle ready for use. Mr Reynolds donated the new vehicle which will operate throughout the local area. 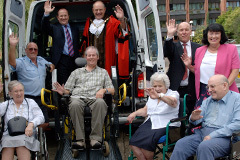 Mr Reynolds business provided and funded the modifications to the bus which now boasts seven purpose made seats, hydraulic ramp and facilities for two wheelchairs. Mr Reynolds has several business interests and since 2005 he has targeted his businesses with generating over £1 million for charities. This money is intended to be distributed both regionally and nationally, with an emphasis on helping the local community. Mr Reynolds decided to buy a Dial a Ride vehicle for the local Council for a number of reasons, but primarily because there was a personal element to the contribution. The father of Simon Venn – an employee at one of Reynolds companies – has Motor Neurone disease and regularly uses the Dial a Ride service. It allows him to enjoy a far better quality of life, by giving him a level of freedom that he otherwise would not have. Mr Reynolds said, “Having made a conscious decision at the start of this year to make some positive contributions to charities, I have developed a far greater understanding of the needs of the community in which I live and work. It has given me great pleasure to purchase a vehicle for the Dial a Ride scheme because I have learnt via Simon and his father what a huge difference this service can make to peoples everyday lives. 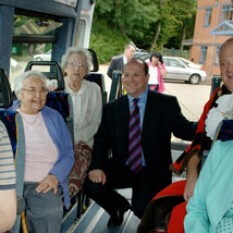 Dial a Ride offers it’s users a vital lifeline that in turn encourages them to leave their homes and enjoy trips to the shops, days out or visits to the local Centre where there is a range of social activities available during the week. I was inspired by the Mayors Charity Appeal “Making a difference” and I decided that this would be the basis for our regional charity work for 2005. We look forward to working with more local organisations in the future “. More information on Andrew donating to Dial-A-Ride.